Well the biopsy was completed yesterday in the morning! The biopsy was done on her foot! We were explained that they found a hard nodule but it will be tested! Results could possibly take up to 5 days! sample was overnighted to be sent to Dr Sholler! They also tested another spot for infection! We may possibly have results on infection today (but they take 24-48-72 hours to grow and they hold them for 5 days!) however blood cultures continue to be negative! Yeah!! Afterwards she was in a lot of pain and the wearing off of the meds in the PICU that were given she was extremely upset! She did take a nap afterwards which she needed! She has been on two antibiotics since being here, one for broad spectrum and the other for skin infections! While they still don't know what the spots are they are treating it until we know! She has had to have 4 units of platelets and blood! Thankfully no more bleeding gums! Today the plan is to have her Mibg scan this afternoon and then get discharged sometime after! As of right now they are probably going to send her home on antibiotics! We should get the results from the Mibg tomorrow and then wait for the biopsy results and then have a plan of how to move forward! Emily does have to start on the nifurtimox pills again by tomorrow or she will be kicked off the trial! So once we have Mibg results we can start those back up and if all clear she should be able to have her last round start on Monday! But all of this is just a plan since we really don't know anything yet! Lots of speculations but we know nothing! Her spirits are much better and she is happy! The pain is much better today and she even walked a few steps for the first time in about 5 days! She amazes us with her strength! We are so proud of her! She shows us everyday just how strong she is and just how well she can handle all of this! She is also asking daddy a lot more questions about what is going on and what is happening! And daddy always knows how to answer her questions just right! We will update as we know more! Just send positive thoughts for no other uptake and the biopsy to be nothing! Hug and kiss your kids and tell them how much you love them! She does look so happy. Thanks for updating us. Always thinking about and praying for your Emily. Give her big hugs from Brennan's buddies. 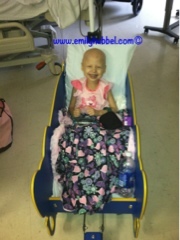 Such a strong girl you are Emily! :) You keep fighting hon, and keep on smiling. A positive outlook is so important, it really does help the body mend. I am so glad to hear that she is feeling better and giving it a go on walking!! WOOT! Praying and fasting for you girl. Sometimes it is so hard to understand, but God is in control and when we praise and worship Him we are acknowledging Him and who He is. Satan shouldn't get any credit because when we grumble we are just giving him ground to work.